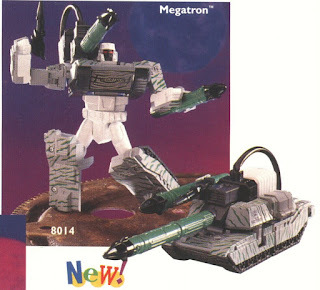 It had been floating in the unfounded rumor scene for a bit, and officially revealed and for sale at Hasbro Pulse this past weekend, but Combat Hero Megatron has finally been released in some form. This is a big one for me as I've always been disappointed that the original toy had never been released. The Optimus Prime Combat Hero homage toy got a release about 5 years ago and mines been waiting for it's partner in combat heroism. These old G2 molds have steadily been a favorite of mine over the years and the unreleased combat hero versions just looked so damn cool. While the new toys aren't the originals, they're close enough. Not to mention, using some damn fine molds. While I've yet to buy a Siege Megatron (though will soon), it's a great looking toy. Though I do think the combat hero deco just looks a little better on it. 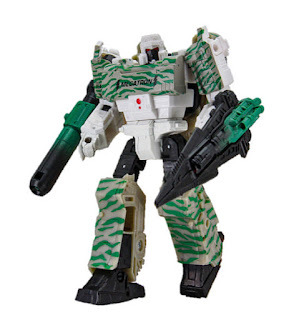 Just the sharp contrast of the white and camouflage is so striking. It's got that sanitary menace that Storm Troopers have. So freaking good looking. Man, even in exclusives based on the molds, Siege is just an amazing Transformers line.